Limo Hire Stag Nights and Car Hire for Stag Parties… So your wedding day is finally here at last but before celebrating the exchanging of vows you have one final night (or weekend) as a bachelor to make the most of! Ace Star Limousine Hire can help in the planning of this important occasion. Careful planning is needed to ensure that your Stag Night and Stag Party is a huge success and not a second is wasted of this big night. We knows Leeds, Bradford, Sheffield and Manchester like the back of our hand. If your stag party organiser needs some ideas for clubs/bars/venues/restaurants etc., our team will be able to help. Limo Hire Stag Nights is all about getting the biggest and the best! Size really does matter in every sense! We have the biggest and very best vehicles like the Audi Q7 Limo Hire, the Hummer h2 Limo, both of which can seat up to 18 people and all our limos come with the most professional chauffeur service in the industry. All Stag Parties are different and require a special limo`s for whatever the master or cunning plan may be. For a fun, entertaining day or evening with a small or large group of up to 18 stags that would like to go out to dinner in Bars and clubs or Bradford Alhambra Theatre or the Manchester night venues let us take you there in style and luxury in either our white Stretch Limousines or our Stunning Hummer H2 Limo. Our Limo Hire Stag Nights will make your party feel like VIPs for the evening so whatever your requirements are on your Stag Do, please do not hesitate to ask as we will do everything possible to accomode your needs! Our promise to you is to offer the finest & latest Limousines available in the UK. Our Limousines are cleaned & regularly maintained. Our courteous drivers are highly trained professionals with years of limousine driving experience. or to discuss your particular requirements, please call our friendly and professional team on 0800 0029 657. 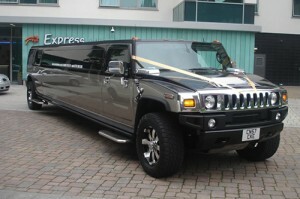 BOOK YOUR LIMO HIRE TODAY!